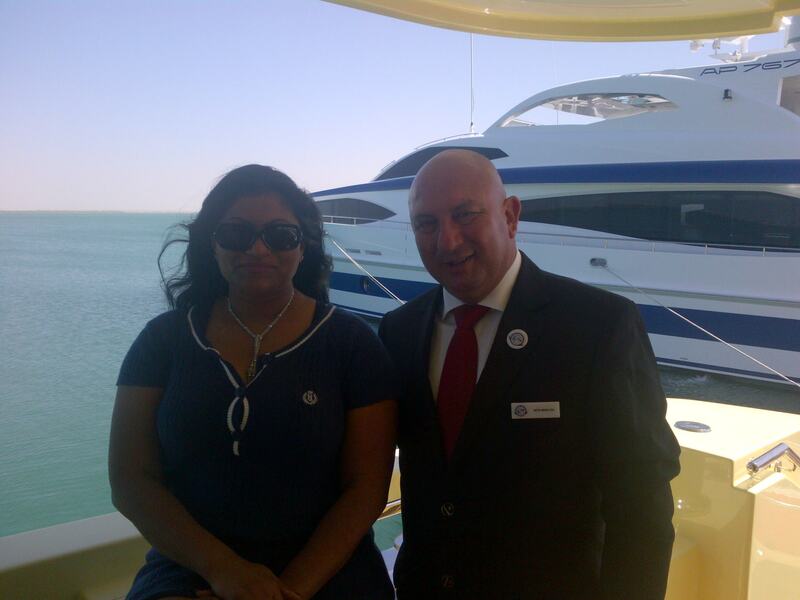 This afternoon, two of us, together with Walid got chauffeur driven to Um Al Quwain to join selected VVIPs and members of the Royal family to see the first Majesty 135 as well as celebrate the 30 year anniversary of an organisation that handles high end yacht brands in this region. Naturally I couldn’t say no to the invitation as no diva can resist fast cars, private airplanes, yachts or exclusive hospitality. After an afternoon with the Fijians from Shangri-la Fiji and Rajah + an evening at the literature festival, I was naturally knackered but mustered up enough energy to get myself to Umm Al Quwain. We were welcomed by traditional Emirati music by the sea…island girl felt right at home next to the clear blue waters. We were in luck as we also ended up being the first people to see the Majesty 105 as well – awesome! After a short drink with Erwin, COO of Gulf Craft who refers to my blog (glad someone other than David is reading them), we get talking about all things to do with yacht brands….he has awesome knowledge of these luxury machines and reiterates the success of Gulf Craft – he is just as passionate as the owners of Gulf Craft who are behind the success of their brands – Oryx, Majesty Yachts and Silver Craft. Its rare to find people who believe so much in what they do that it becomes their life. I would love to find that love and passion and I reckon it lies in writing. Mainly because its one thing I can take control of and see it through without depending on anyone…its a liberating feeling. I have loads of pictures of the yacht and both Erwin and Notis were amazing hosts – thanks Erwin for being so attentive and Notis for taking the time for a personal tour of the Majesty 105 despite being busy with the Who’s who of the yachting world. It was also delightful to see the energy and enthusiasm of Trixee Loh who is the female power behind the Boat Show…its the best enlightened 2 hours I’ve spent today and its not just because Trixee is a Singaporean and I have an affinity with all that is remotely associated with Asia having lived in KL for 9 years with weekend trips to Singapore and Orchard Road. You will see the amazing work Trixee’s team has put forward at next week’s DIBS. 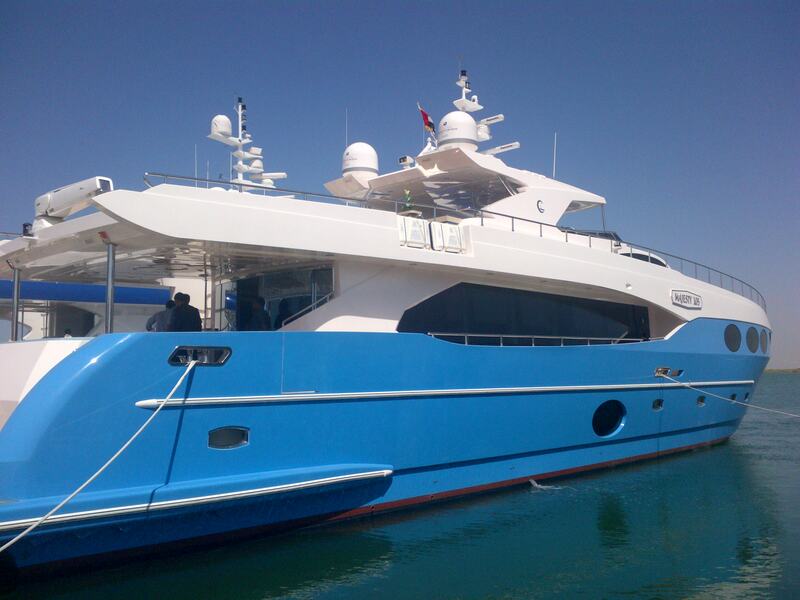 Meanwhile, I salute Gulf Craft, their awesome team for an amazing afternoon in Um Al Quwain. They will be a force to be reckoned with next week! We caught up as well with Saeed Hareb on DIMC – the last time we had time for a chat was years ago with the Victory Team so today was nice just to be able to see him in an informal setting. My next venture is a Woman’s Empowerment talk with a beautiful and magnetic Royalty – watch this space!